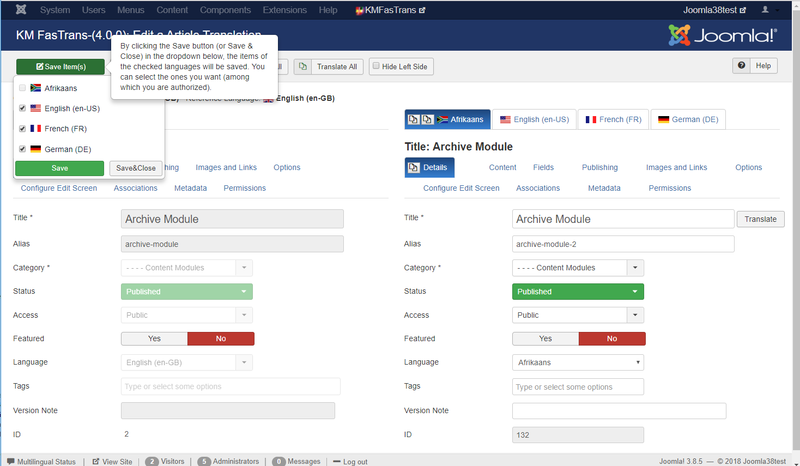 KMFasTrans, your multilanguage manager for Joomla! Although this info is a bit old, it is still a good introduction to the main functions of KMFasTrans. We are in the process of updating all the documentation. In a period of approximately one or two months we plan to release KMFasTrans 4.0.0 running under Joomla 3.8.0 and it will be a very important release with many new features, some of which are described below. This feature will allow you to create and / or edit the elements in all the languages ​​you have chosen and save all of them simultaneously. Another feature to increase the speed of creation of a multi-language site, the quick creation of elements in several languages simultaneously. Version 4.0.0 will allow several target languages to be loaded simultaneously on the editing screen so that it will be possible to create new elements or edit existing elements in several languages at the same time. This greatly increases the speed of creating translations as it will be possible to copy all the source language options to all target languages simultaneously. This function makes it possible to copy an element in the source language on the elements of selected the target languages, preserving of course those fields that are language dependent, such as the category to which an article belongs. This option is very useful for cases in which an item (an article for example) is not translated to all languages. It is possible to make modifications in a single source language and copy them with a single click to all the desired target languages. Sometimes it is convenient to have a machine translation of an article, for example, that serves as a basis to make the correct translation. 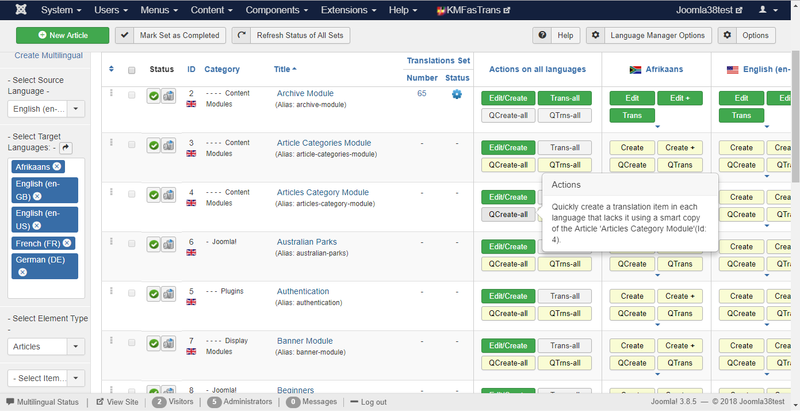 With version 4.0.0 you will be able to make a machine translation of an element to all the desired languages. And you can do it even when the elements in those languages ​​do not exist, using the QTrns-all function that will create and translate the elements in the same operation. Fantastic extension with great support! Best Joomla 2.5 Multilingual Solution Out there! Does exactly what you wants. Easy to understand and excellent ( quick ) support.